Giving in memory of a loved one is a great way to honour their name, and leave lasting support in place for the brave men and women who have risked their lives for our country. We are here to help ensure that when building a tribute, it is honourable, sensitive and unique to the individual. By donating to ABF The Soldier’s Charity you are helping to provide a lifetime of support to soldiers and veterans from the British Army, and their immediate families, when they are in need. We make grants to individuals through their Regiments and Corps and support a wide range of specialist charities that sustain the British Army ‘family’, both at home and around the world. Please find below how you can help to change the lives of ex-servicemen and women and their families. All gifts are helping to change the lives of ex-servicemen and women and their families. If you would like more information please do feel free to get in touch and on behalf of the Army family, thank you so much for your continued support. Our online memorial book offers the opportunity to have a loved one’s name input within it, along with a short message. There would then be an option to build upon this by creating a celebration page which would allow you to input images and messages, to share with family and friend and remember a loved one forever. Click to visit the memorial book. You can create a tribute to your loved one and honour their memory through creating a unique page to input images and messages, and share with family and friends. 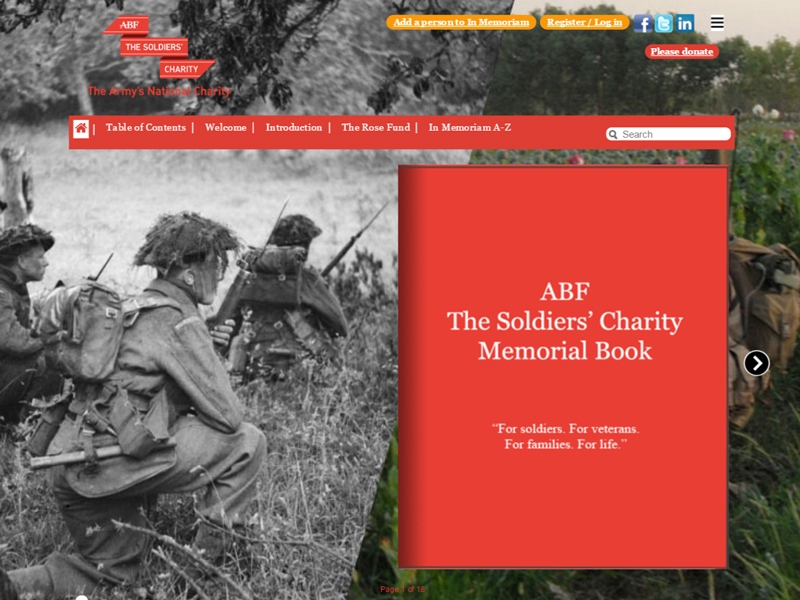 Your tribute can then collect donations and raise funds in support of ABF The Soldiers’ Charity. You can arrange to do a collection at a funeral in lieu of flowers or during an event taking place to raise money in memory of a loved one. Please get in touch using the below contact details to request collection envelopes. Our team are here to answer any questions you may have. Call us on 020 7811 3231 or click to get in touch about in memory giving.